As the Daleks continue their relentless advance with intent to destroy yet another innocent and defenceless world, the Doctor seeks out help from a shadowy guerilla force of some renown mentioned in Schandel’s reports. Hidden inside the Obsidian Nebula, the mysterious Lady commands a strong but dwindling force that must also keep the monstrous Unlived in check, forcing the Doctor to directly confront his past and ideals as the fate of the Time War hangs in the balance. The advertising and cover make no secret of the Lady of Obsidian’s true identity, but it’s nonetheless incredibly fitting that it should be Leela who is spearheading these attacks to save so many innocent lives. Indeed, so prominently including Leela masterfully works on two very distinct levels. Firstly, it allows a very direct comparison of just how different but ultimately just how similar the War Doctor is to his previous incarnations as his resolve and mettle is tested like never before. More importantly, however, is that her presence gives further insight into just how traumatic and disturbing the effects of the Time War can be on an individual. The victim of an experimental Dalek attack, Leela has been living her life with complete memories of every potential timeline she could ever have experienced, her mind brimming with actions taken and not taken as well as the consequences of each and every possibility including each of her own potential deaths. Not knowing what is real and what is not and burdened by so much heartache, the Leela on display here is an altogether different being than that written in any previous story at any point in her life, and Louise Jameson gives possibly her strongest performance yet as she evokes the excruciating inner turmoil of Leela’s mental suffering perfectly. It’s rare that the War Doctor is afforded the opportunity for genuine emotion since he has become so permanently scarred given the impossible situations in which he so often finds himself. However, the scenes in which he slowly tries to remind Leela of her true past and their time together are among Hurt’s most memorable, the emotion in his voice drawing upon the lengthy and meaningful history of these two characters together expertly. Yet while emotions are the driving force of this story, Smith also manages to include not only the Daleks attacking once more but also an altogether more intriguing menace known as the Unlived, an army of shadowy beings who never fully formed their potential space in this timeline. While it is true that the mystery of Leela remaining such a prominent narrative force throughout the story does mean that the Unlived don’t quite get the chance to develop beyond a plot device as much as might otherwise be anticipated, these distorted vestiges of humanity’s all-consuming desire to destroy is remarkably visual and provides a suitably chilling non-Dalek threat that again hints at the wonders and horrors of the Time War. 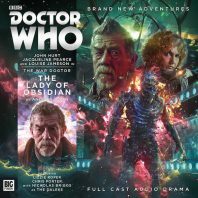 ‘The Lady of Obsidian’ sadly doesn’t find time to explore who the Doctor has become in the eyes of his most war-ready companion, a fact that hopefully the concluding ‘The Enigma Direction’ will be able to include to compare the Doctor’s past to his present through eyes other than his own. Nonetheless, Louise James and John Hurt are stunningly magnificent together, and the developing heroism from Ollistra that likewise owes itself to her time spent in his company helps give further depth to this tense and atmospheric tale that confidently revisits the past in order to send Casualties of War in a bold direction for the finale.